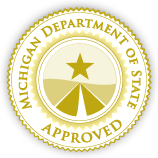 The State of Michigan allows eligible drivers to complete a Basic Driver Improvement Course (BDIC) to keep traffic ticket points from being added to your driving record, which also prevents insurance premium increases. If your citation qualifies for a BDIC, the state will mail you a notification letter which will include a deadline for course completion. No Classrooms. No Need to Report Your Completion. No Kidding! Our online driver improvement course allows you to avoid ticket points and insurance premium increases from traffic tickets without having to sit in a classroom listening to boring lectures. Take it on your computer, phone, or tablet on your schedule and at your convenience. We even report your course completion to the state so you don't have to! Once you register, you can start immediately. Finish the course in one day or take your time — log in and out often as you like. The course saves your place. We provide 24/7 customer support via live chat and email to answer any questions about the course, registration, or technical difficulties. You can also call our U.S.-based customer support team at 1-800-393-1063.